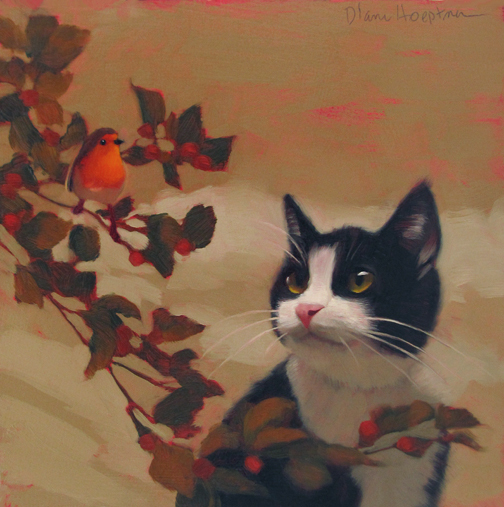 Diane Hoeptner: Tuxi Sees Bird, Not enough time? Repeat this mantra. Tuxi Sees Bird, Not enough time? Repeat this mantra. Too much to do and not enough time... I've been repeating the mantra: "Getting it done is more important than getting it perfect" in my head. It applies to laundry, grocery shopping, bill paying and a myriad of mundane tasks that just gotta get done... This mantra is not ideal for painting, but then time spent painting is nearly never mundane, so there's that. What a sweet picture! So sensitive and beautiful and intriguing all at once! Well done! I like this mantra "Don't let the perfect be the enemy of the good".